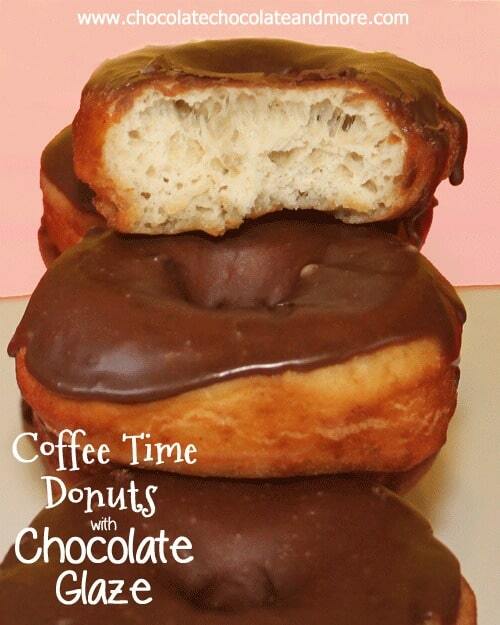 Coffee Time Donuts with Chocolate Glaze - Chocolate Chocolate and More! These Coffee Time Donuts with Chocolate Glaze are so light and airy, the perfect yeast doughnut! It’s winter. It at least that’s what the calendar says. We’ve had temperatures in the 70’s the past few days. In January. Here in Georgia, we don’t get icy cold that often. It snows maybe once every 5 years. And when it does snow and I mean just a dusting, everything shuts down. The weatherman talking about snow, will send everyone rushing to the store to stock up on supplies because, you know, we might get ONE INCH, and not be able to get to the store for a day or two. The school closings will start immediately, before the first flake ever drops. I know everyone up north is laughing at us as they read this. I grew up in Delaware. We had snow. Not every week but probably 5-6 good snows a year. Enough that the snow plows would have to come out. Enough, that maybe, schools would delay opening for an hour. Just so the snow plows could get the major roads cleared. If you worked, you were still expected to be there on time. I don’t miss the snow one bit. I was the one who had to shovel that snow. You’d spend an hour or 2 out there, clearing the driveway and then the snow plow would finally get around to the neighborhoods late in the day, and block all your hard work. Driving in it wasn’t too bad, if you knew how to do it. Just like driving in the rain, you need to adjust for the conditions. Playing in the snow was different. We had the best hills in my neighborhood. Sledding was such a rush. Flying down the hills, hitting the turn onto the next street. We’d even make little jumps to get some “air time.” Great memories. I guess I’m thinking about all of this because my son is going skiing this weekend for the first time with the church youth group. My kids have seen and played in snow, but not “real snow.” I’m excited for him. I’m a little nervous for him. After all, people break bones skiing. I’m trying not to think about that part. I want him to have the most amazing time and create memories that will last a lifetime. So what does any of this have to do with donuts? I have no idea. Other than making donuts from scratch for those you love, will also create warm memories. These donuts are fantastic. Good flavor, light and fluffy but sturdy, if that makes sense. Not mushy might be a better way to describe them. 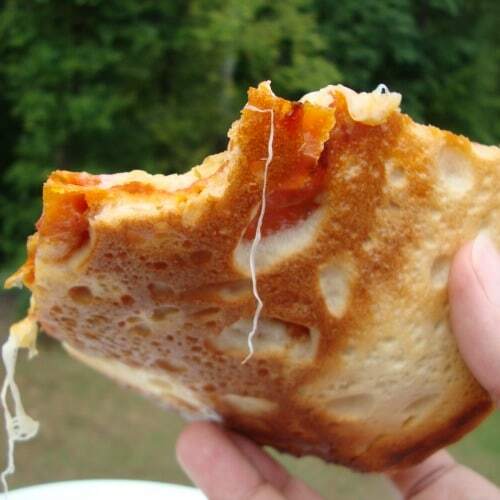 Anything made with yeast will give you a flavor and texture that can’t be matched. In your mixing bowl, combine 1 cup flour, sugar, salt, cinnamon and yeast. Combine milk and shortening in a microwave safe bowl and warm in microwave. The shortening doesn't need to melt but you want your milk warm, around 110 degrees. Add egg and milk to flour mixture. Beat until smooth. Add in remaining flour to form a stiff dough. Cover with plastic wrap and let rise in a warm place until double in size, about 1 hour. Turn out dough onto floured surface and roll out to 1/2 inch thickness. Cut out donuts with a donut cutter or use a round cutter and then a small round object (I used an icing coupler) to cut out the holes. 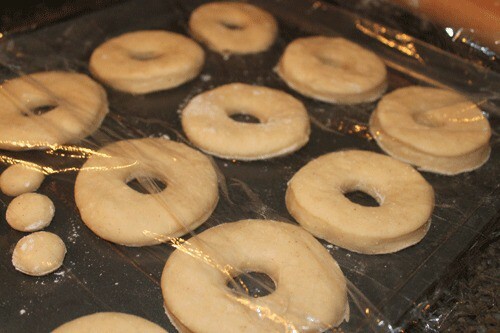 Place cut donuts on a cookie sheet, cover with plastic wrap and let rest for 45 minutes. Heat oil on medium heat in a heavy bottomed pan to 375 degrees or if you don't have a cooking thermometer, you want oil to immediately bubble around dough when placed in hot oil. You can use one of the donut holes to test. Gently place donuts in hot oil and cook about 90 seconds per side, just till golden brown. Remove to paper towel line rack to drain. Let donuts cool till just warm. For the glaze, Sift sugar and cocoa to remove any lumps, whisk in milk and stir until smooth. Either dip donuts in glaze or spoon glaze over donuts. These donuts are best served warm but my kids will tell you they were just as good the next day. I want to come over to your house and have coffee time with you and those fabulous looking donuts!!! Me too, me too! They look so delish! I keep telling people I’m going to make donuts, but I just never have. They look so delicious, I don’t know why I’ve resisted all this time! Joan, I’m making these as I type this! TY so much for posting this! I wish I could just reach in and gobble these up! Thanks so much for Linking up at Show Me Your Plaid Monday’s! These are my husband’s and my daughter’s favorite donuts and we are a donut lovin’ people around here – I am going to make these for them this weekend. That should shock them both! 🙂 Look delicious! I hate snow! In Ohio, we can get a fair amount. The city still shuts down, people can’t handle it! Next time it snows, I’m going to make donuts in your honor! I’m going to make THESE donuts! Look how fluffy they are!! My coffee is so lonely this morning. It needs a donut! Could use a couple donuts about now to go with my morning coffee on this snowy / sleet morning. Will be keeping this fantastic recipe and making them soon. I will try what I call the ‘long’ version. I normally just grab a tube of refrigerator biscuits and make donuts from them. OH Be still my heart. My absolutely favorite donut is a chocolate glazed donut. I am dying to try a homemade donut recipe. Pinning!! 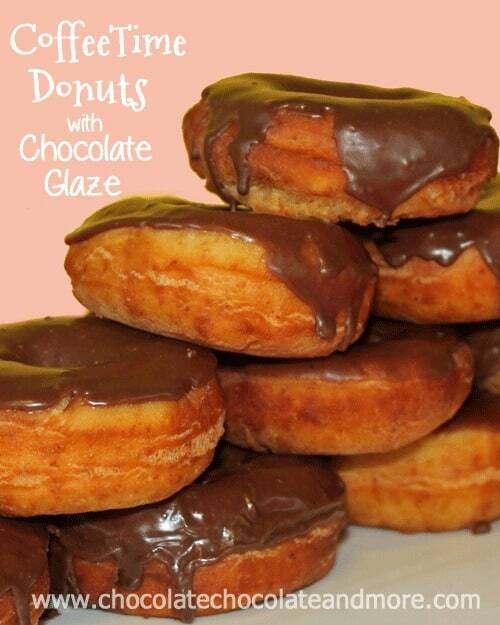 I love donuts with chocolate glaze. Nothing fancy, just simple! I wish we had weather in the 70’s! My son has no school today because of all the snow we just got. My husband and I hate snow, so we’re seriously considering moving elsewhere. My son on the other hand, loves it. we would have so much fun being neighbors Ashley! The house next door is for sale…. Could you bake these instead of frying? I’m sure you could but I’d have to try it to tell you a temperature and for how long. Sounds like a good reason to make them again! Yum, yum, yum. I have a serious donut weakness and you’re killing me with these! Thanks for linking them up to What’s Cookin’ Wednesdsay! Wow, these donuts look soooo good! I have a donut addiction so I can’t even eat them very often or I want them all the time 🙂 Yours look like they are professional, great job. WOW – your donuts look divine! My hubby would die for a few of these – he has a bit of a donut obsession! You could open up your own donut shop! Smile. They look so fluffy and delicious…would love one with my coffee! but I take a couple of these donuts on a snowy day or not! I’ve been wanting to make yeast donuts for a while… just haven’t gotten around to it. Love the “old” recipe! I really want to just grab a spoon and dig into a bowl of that glaze! These look amazing! What does 3 1/2-3 3/4 cup flour mean?? It means you’ll use between 3 1/2 cups to 3 3/4 cups of flour. 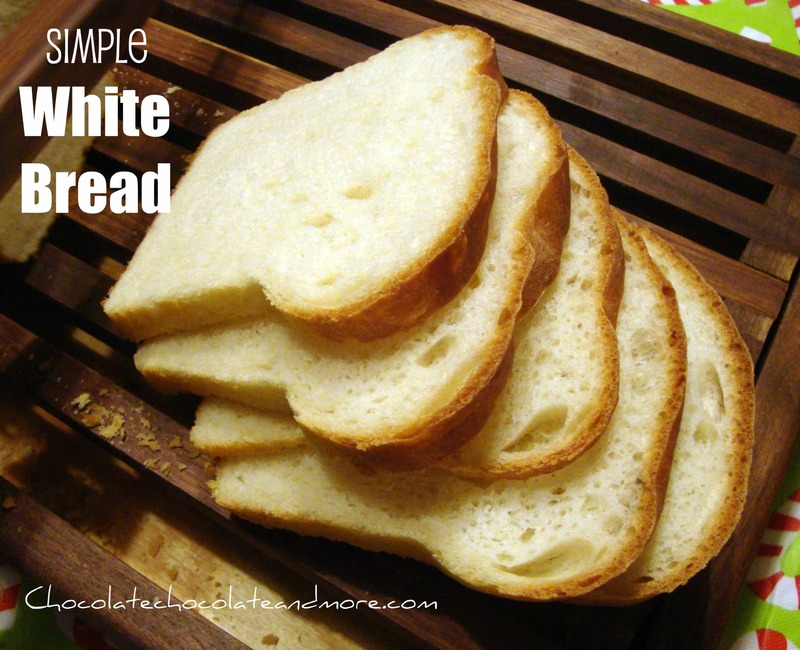 I love your recipes.. With this recipe can I use rapid rise yeast? Yes you can, your rise time will be shorter so keep an eye on it.